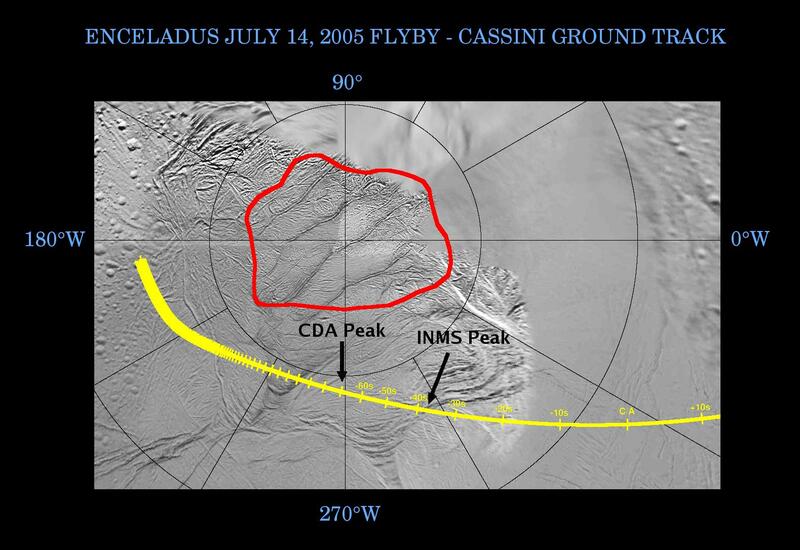 This graphic shows Cassini's path, or ground track, as it crossed over the surface of Enceladus near the time of closest approach during the flyby on July 14, 2005. The ground track is indicated by a yellow line, marked by increments of 10 seconds before and after closest approach. The spacecraft came within 175 kilometers (109 miles) from the surface of Enceladus at closest approach. The red contour encloses the region on Enceladus around the south pole that is the approximate boundary of the warm region, as measured by the composite infrared spectrometer instrument on Cassini. As previously announced, temperatures observed within this region reached as high as 110 Kelvin (-260 Fahrenheit). As Cassini passed over the southern polar terrain, its ion neutral mass spectrometer and cosmic dust analyzer instruments detected material coming from the surface of the moon. The ion neutral mass spectrometer measured a large peak in the abundance of water vapor at approximately 35 seconds before closest approach to Enceladus, as it flew over the south polar region at an altitude of 270 kilometers (168 miles). The high rate detector of the cosmic dust analyzer observed a peak in the number of fine, powder-sized icy particles coming from the surface approximately a minute before reaching closest approach at an altitude of 460 kilometers (286 miles). Analysis of this detection points to the south polar region as the source of the material. Results like these, pouring in from various Cassini instruments, indicate the warm south polar region and, in particular, the 'tiger stripe' fractures straddling the south pole, as the sources of heat, water vapor and small, icy particles. Enceladus is a surprisingly active moon. Why its south pole is the site of its activity is a mystery.